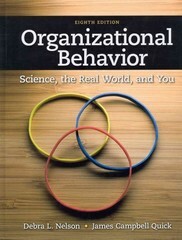 Organizational Behavior 8 Edition Guide today's students as they learn not only the concepts and theories that enhance the management of human behavior at work but also how to practice these skills with Nelson/Quick's ORGANIZATIONAL BEHAVIOR. The latest edition of this leading text clearly demonstrates how organizational behavior theories and research apply to companies today with engaging cases, meaningful exercises, and examples that include six new focus companies students will instantly recognize. The authors present foundational organizational behavior topics, such as motivation, leadership, teamwork, and communication. Readers also examine emerging issues, such as the theme of change as well as globalization, diversity, and ethics. The authors anchor the book's multifaceted approach in both classic research and leading-edge scholarship. Timely examples from all types of organizations reflect today's most current trends. Self-assessments and other interactive learning opportunities encourage each reader to grow and develop--both as an individual and as an important contributor to an organization.